A man comes to town and befriends a preacher. He mixes truth-spoken with drug-fueled visions. He kills in the night and then moves on to capture the hearts of men. The town is soon flooded with one man’s lies. What is this perverted faith being presented in Far Cry 5? The use of religious imagery and language are often intertwined in video games. Faith presented as a misunderstood mystery. 1998’s Xenogears delved into crucifixion, a Roman form of the death penalty. The game then took things a step further by having the crucifixion take place on a hill called Golgotha. Sound familiar? Japanese RPG’s have a tendency of pulling parts and pieces from all different cultures and shoving them into their narratives. 2. Ken Levine’s BioShock Infinite plays around with the concept of baptism being a key turning point in a man’s life. The beginning of the game going so far as to use baptism as a point of entry into the City of Columbia. Press X to Accept Baptism. What should the Christian response be to distortions of faith in media? We should not be surprised at non-believers not understanding spiritual things. 2. We should recognize / be aware of certain genres of media having a predisposition to use religious imagery and language just because they can. 3. We should call out / shed light on depictions of faith that are not accurate and veer into cult territory. Far Cry 5‘s baptism trailer clearly depicts an unhealthy faith and devotion to a man, who will fail them. In watching the trailer, I’m reminded that God is not oppressive; God is not about control. No, oppression and control are tools of the devil. In the end, Far Cry 5‘s fictional Hope County, Montana is in need of a spiritual cleansing. These people need to experience the freedom that Jesus Christ offers and be freed from the cult-ish slavery they are mired in. Being a Far Cry game, violence and rivers of blood will be the only way to purity. Will you make the trip to Big Sky Country when the game is released? Will you embrace the violence, the distorted faith presented? My intestines won’t stop moving. I feel like a punching bag. The sides of my stomach hurt. I have no idea why. Living with irritable bowel syndrome (IBS) is debilitating. The first time IBS found me was in elementary school. I remember running around the house, clutching my stomach, screaming. My parents didn’t know what to do. I didn’t know what to do. A few uncomfortable medical procedures later, nothing. High school was an IBS nightmare. The thing about IBS is that it can sneak up on you in a moments notice. Forcing you into an immediate posture of porcelain throne worship. I remember a friend telling me that it was all in my head. That I was the one causing it. I remember a distinct feeling of wishing I could transfer my IBS to someone else. If they could only feel what my body does to me, they would know that I am more of a hostage to something far bigger. The Apostle Paul talks about a thorn in the flesh in 2 Corinthians. I have always related to that. I have wondered if God gave me IBS as a way to keep me humble, focused on Him. In times of an attack, I pray for God’s strength to get through those moments. My thorn in the flesh is not visible nor is it logical. I can’t tell when it is going to come and visit next. But I have learned to notice when my body is tightening up; I have learned that exercise helps reduce stress. God has taught me to rely on His strength when I have none. I just need to rely on Him when I am running at full capacity. Game on, dear friends. Game on. 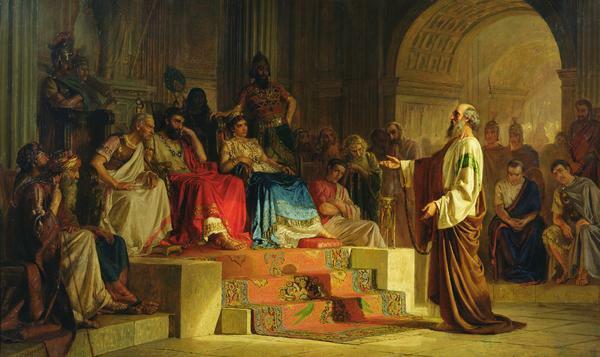 Apostle Paul On Trial by Nikolai Bodarevsky, 1875. Came across these verses and wanted to share. Like Paul’s prayer, my prayer is the same. I want everyone to come to know Christ as I know Him. Had a crazy situation pop up at work last week. Words were spoken that should not have been; feelings were stepped upon and ripped. In the end, God helped me to realize what the core issues were–in this case, issues of personal respect and respect for my work position–. God told me to walk into work on Monday and let Him do the talking. So I did. He did amazing things! Words of life were spoken. Relationships changed. I know 100% that it was God working through this event. I want you to know God as I know Him. Short time or long. Yesterday, I wrote about how persecution led the early church to disperse, thereby fulfilling the Great Commission. How does this apply to us today? Admit it, the church pew that you sit in week-after-week is comfy. The routine of dropping your kids off in children’s church (free babysitting! ), enjoying coffee and fellowship in Sunday school, and going through the motions in the main service is familiar. One might call the church routine rather cozy. You know what to expect; you know that nothing uncomfortable is going to happen. If you don’t want to shake hands with someone, you don’t have to. Sure, you may feel spiritually uncomfortable/convicted by the sermon, but church is overall a safe environment where you don’t have to step out of what you know. I would like to make a bold statement. The people who need Christ the most are not the ones who are going to show up at your local church. Instead, the people who need to hear the Good News are those in our work places and those we meet on the everyday streets of life. Ever wondered why churches are built where they are? I have. Here in Longview, for instance, we build a good chunk of our churches away from the city’s dividing line, Highway 80. For those that do not live in East Texas, or Longview for that matter, Highway 80 represents a physical shift from the nicer to the older/rougher part of town. The highway itself is filled with strip clubs, homeless, and even prostitutes. All people that need Jesus. So why aren’t more churches built along 80? Ultimately, I think, it boils down to our modern church model. The people who would attend a church located on Highway 80 are not the type who would be able to contribute money on a regular basis for tithe (which keeps the church running). A church located along this line would have to be ran on donations or some other sort of creative model. Not sure how one would accomplish this but the need to meet people where they live is great. No matter what the cost. But We Are Called To Step Out. As we saw starting in Acts 5, if we do not step out and go, God will stir up the church and make us go. What does all of this look like in practice? Taking on a God-perspective and seeing people as He sees them. Recognizing that there is a need to tell people about Christ outside of our churches, our comfort zones. Not only recognizing but also actively doing something about it (the going part). This can be as simple as engaging a co-worker in conversation; this can be has complicated as physically moving overseas to preach the Gospel. Regardless of location, all Christians are called to share about Christ. I do not think that there is anything wrong with going to church or sharing life with other believers as the early Christians did in Acts. At some point though, we are supposed to branch out: locally, nationally, globally. Living with the perspective that God has, that there are needs all around us, is hard. I know personally I find it hard to step out of my own life situation. Too often I get bogged down in the day-to-day stuff. As a Christian, I am called to be active, to engage, and to go. For most of us, I don’t think this means suddenly selling all of our possessions and moving overseas. Obedience is the key here as we strive to daily live in obedience to Christ and share Him with those around us. Jesus commanded his disciples to tell others about what they had seen, learned, and experienced during their time with him. They were to go and tell others about the Good News, that the Son of God had come and paid the price for all sin; that Jesus had lived, died, and had been resurrected on the third day. The Holy Spirit soon comes, Peter preaches/confirms that Jesus was the Son of God, and the body of believers grows in numbers. One will notice, however, that no one is “going”. Instead, the believers begin to form a tight knit community, sharing everything they had with one another. Little did they know that a storm was coming. Note: The key verse here is verse 39 – “…But if it is from God, you will not be able to stop these men; you will only find yourselves fighting against God.” Who could argue with that? Christ’s command was finally being obeyed, His word was being preached. God was using a potentially evil situation for His good. But how does all of this apply to Christians today? Check-in tomorrow to find out. 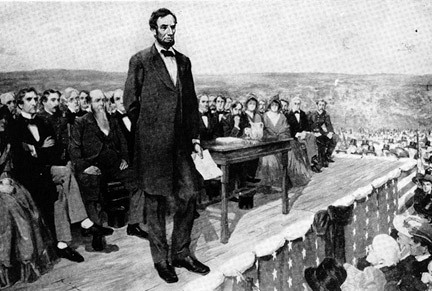 July 4, 2011, the United States is faced once again with events that threaten to destroy our great nation. The national debt is out of control, foreign countries own this debt, both threaten to undermine the very freedom we have fought to preserve since our inception. I am saddened that while our elected officials bicker and politic, the freedom that has been purchased with American blood is forgotten and dishonored. Only with God, “under God”, can we bring America back to what it once was. This issue is an issue of the heart, a spiritual civil war. One that can only be won through the saving and changing power of Jesus Christ. I wish everyone a happy 4th of July! Enjoy that which has been purchased with a price.